29 Sept 2012: [Extension] Son Henry has turned up for the weekend to give us a working Saturday and Sunday morning and we have made good progress. 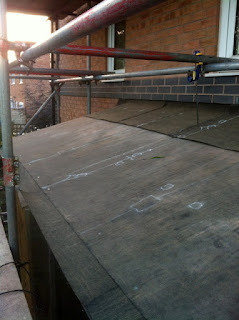 The extension is now felted, roof and side walls, although we didn't have enough to complete the south facing walls. 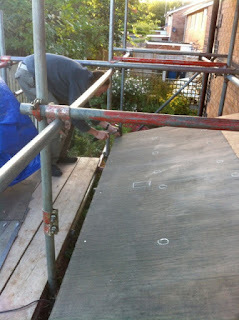 We are beginning work on the aluminium raised seam roofing. Before the roof is felted over we do a very taping over of every roof-seam and nylon bolt, with external quality duct tape. 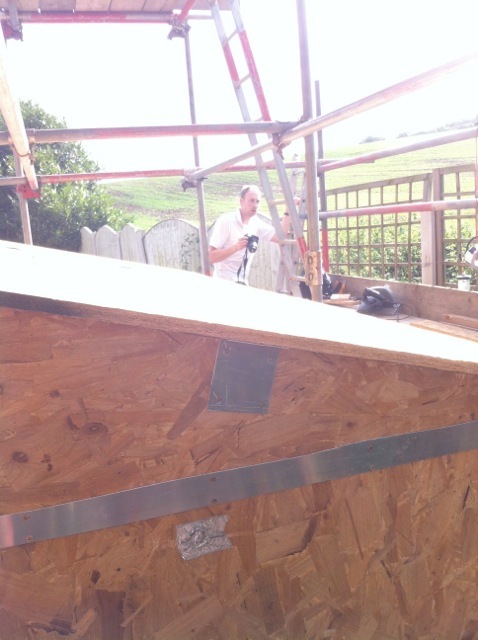 We run the circular saw along the eaves board to make sure that it is perfectly straight and even. The gap between the roof and wall has been filled with expanding foam and the surplus is cut away level with the roof deck. 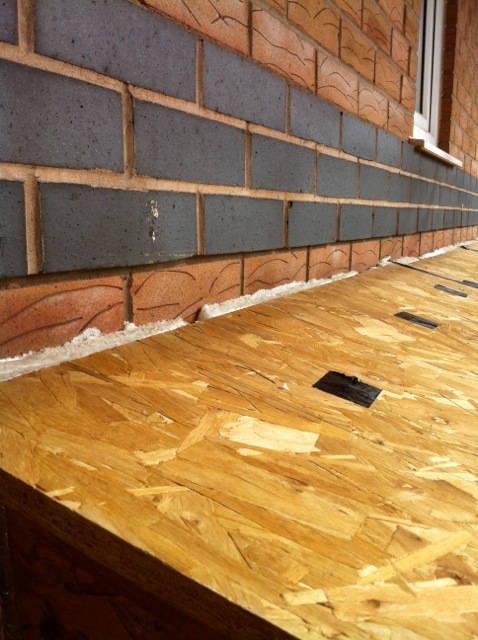 We have one red brick course for the roof upstand and the flashing (which will fit under the blue brick). 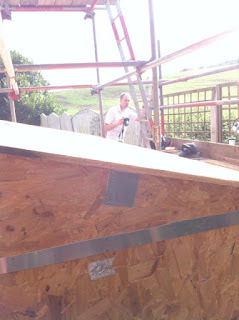 Henry's busy getting the details right before we fasten down the felt. 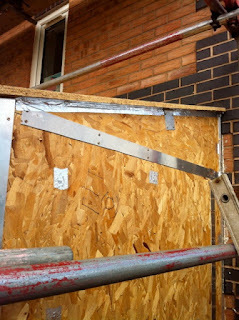 Small gaps at the top of the wall between the wall and the roof deck are filled in with compressible foam, then taped over to make them airtight. That edge work is done, and a final aluminium connecting bracket is fitted. This baby isn't going to fly away in a strong wind! 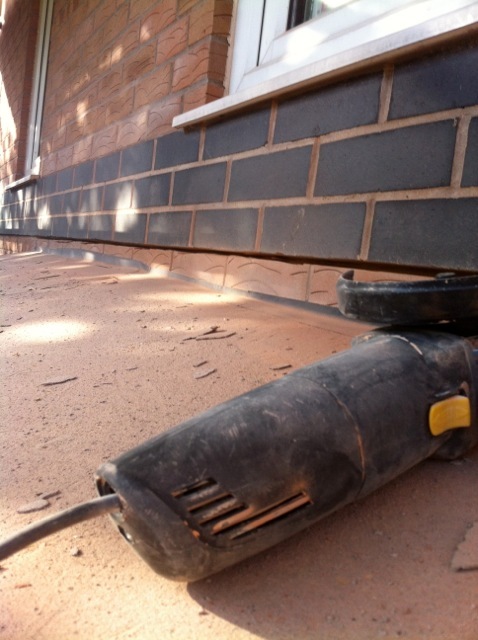 Before fastening down the felt, we remember that it's better to groove out the mortar just below the blue brick course now. 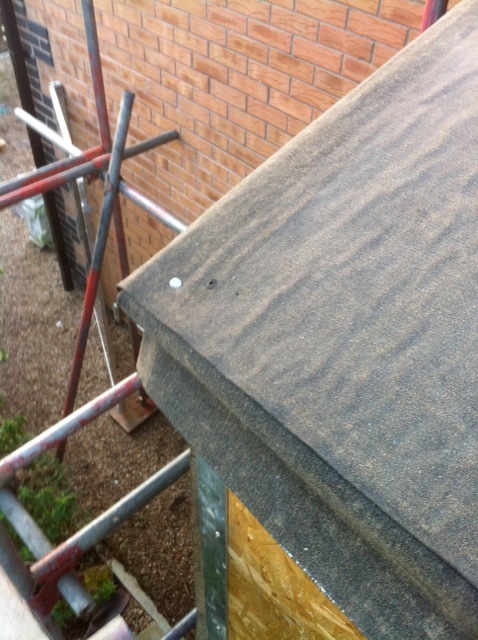 If we do it later, the brick and sand dust will ruin our lovely aluminium sheet roofing. 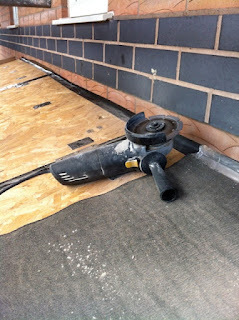 So the heavy duty masonry blade is fitted to the angle grinder. We were right - a helluva lot of abrasive dust is created, and it is an unpleasant job needing goggles and a breathing mask. We now have a very good 10mm gap about 25mm deep, which is enough for me to insert a lead flashing in a bed of resin, sometime in the future. 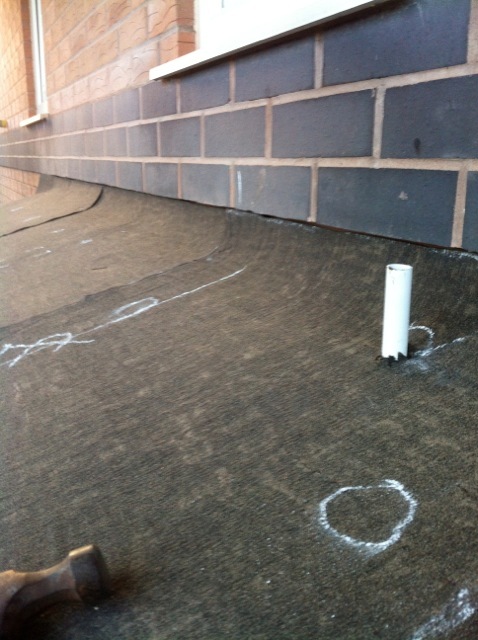 Another job that is needed is a small conduit from the solar panel into the room below, so we can have a 12volt DC lighting system in the extension, running off the future batteries. Don't worry, the rain will come down the conduit, there will be a vertical aluminium duct here for the solar thermal pipes from our PVT panels. 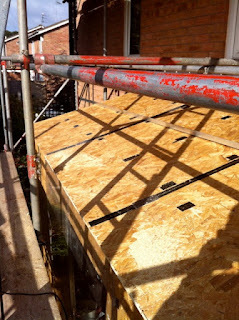 The moment arrives when we can fasten down the first large sheet of roofing felt on the roof. 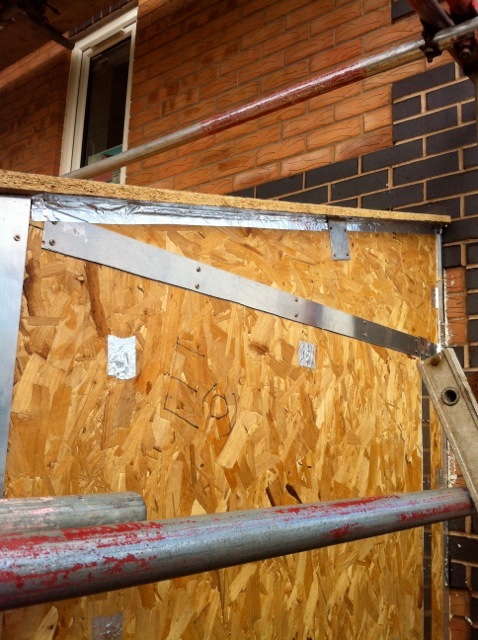 Later we are going to fit the aluminium roofing and it is vital to know where the nylon bolts and aluminium connecting plates are. We have devised a dry welting detail for the eaves and here goes, this is the first clout nail going in to confirm our decision. 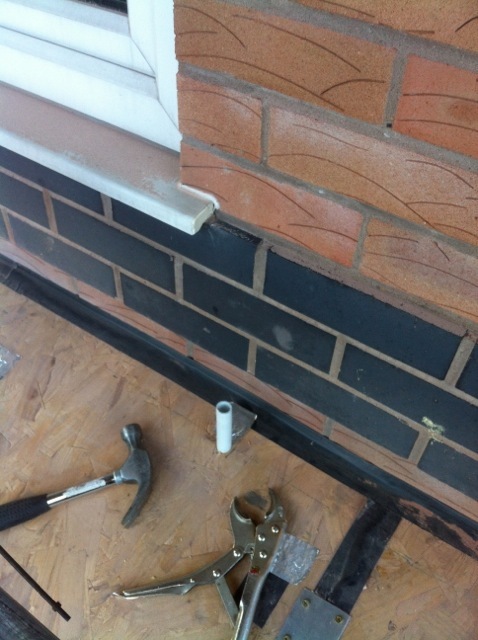 The long felt is lined up with the edge of the board, and another 200mm strip is worked in along the eaves. 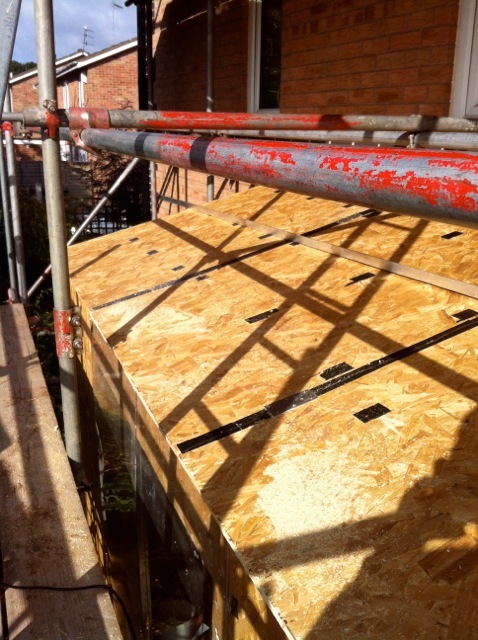 It's tucked under the main felt, and then wrapped around and under the roof deck and secured. At the top edge, the felt is brought up to the underside of the blue brick. We've had to tailor it around the vertical conduit. the centreline chalk line indicates the centre of the roof, as a guide to fitting the upstanding seams. 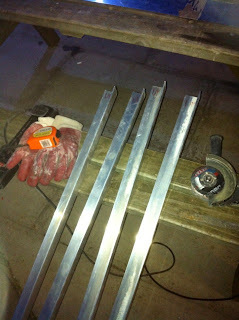 The standing seams are being prepared after dark, all based on 40x40x3mm aluminium angle. 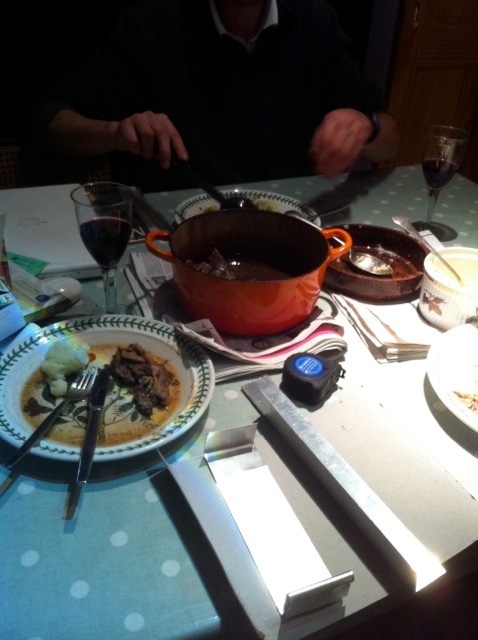 During dinner, we are thinking about the cutting details for the aluminium 0.7mm sheets that will go between the seams. They will be like stiff trays with upstand and downstand at the end details, and a welted detail along the roofline, finally fixed with rivets along the seams and along the eaves detail. 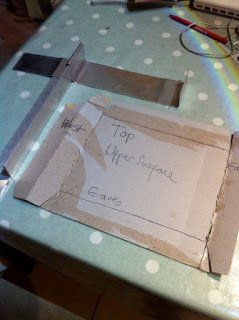 The template is now finished, so in the morning, we will be able to cut each sheet accurately.